Sensations Pour Elle is a Parisian Brand that have designed a range of brightly coloured individual dresses. 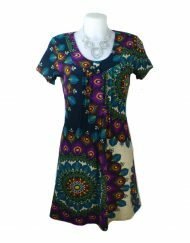 The dresses with their multi coloured floral prints certainly are an eye catcher. Length Approx 39″ 99cm ( Shoulder to hem ). You won’t be finding this individual summer dress on the high street! Wear with one of our shrugs to finish off an ideal summer outfit. 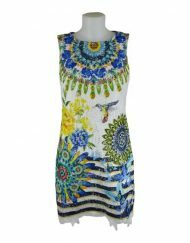 Each dress has a slightly different print, which gives each dress its own personality. 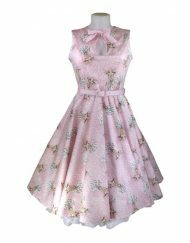 The dress has a part elasticated top with adjustable straps which together give the top of this sundress a fitted look, contrasting with the full floaty knee length skirt. 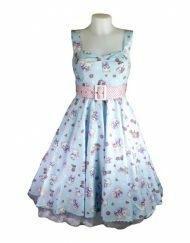 Pretty floral attached tie belt wih button detail adds another feminine touch to an already eye catching dress. 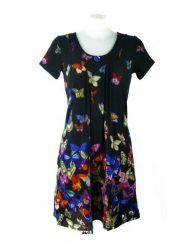 Whether you want a summer dress for day or evening this fits the bill.